The all-new 2014 MDX, the third generation of Acura's acclaimed 7-passenger luxury performance SUV, goes on sale at Acura dealerships nationwide, offering comfort, connectivity and performance every luxury customer wants at a price that no other luxury brand can match. Available for the first time in a new two-wheel drive model, pricing for the 2014 MDX begins with a manufacturer's suggested retail price (MSRP) of $42,290*, a substantial $990 reduction in starting price versus the outgoing 2013 model. The 2014 MDX adds a bevy of new standard features - including Smart Entry with Push Button Start, Jewel Eye™ LED headlights, exterior and interior LED lighting, Extended Slide second-row seating with One-Touch Walk-In for third-row access, an 8-inch On-Demand Multi-Information Display touchscreen, Expanded View Driver's Mirror, a powerful 432-watt Acura sound system, and an acoustic glass front windows and windshield. New from the ground up, the 2014 MDX has a 2.8-inch longer wheelbase, and is lower and narrower for reduced frontal area and enhanced fuel efficiency. With high-strength steel, aluminum and magnesium comprising 64-percent of its body structure, the 2014 MDX is 275 pounds lighter than the previous model with the lightest published weight in its segment, which directly contributes to improved acceleration, nimble handling, and class-leading fuel economy ratings. The 2014 Acura MDX is powered by a new 290-horsepower direct-injected i-VTEC 3.5 liter V-6 powertrain with fuel-saving Variable Cylinder Management technology. Compared to the 3.7-liter engine it replaces, the 3.5-liter V-6 in the 2014 MDX offers an 8-percent increase in torque at engine speeds below 2,750 rpm for greater overall responsiveness. Due to improved operating efficiency, horsepower output per liter is up two percent and torque output per liter is up 4.4 percent compared to the previous model's engine. Together with the 2014 MDX's substantial reduction in curb weight, overall performance is enhanced, including quicker 0-60 mph times and 8-second quicker lap times on Germany's Nürburgring Nordschliefe (North Loop), where both the new and outgoing model were extensively tuned and tested. The 2014 MDX is the third generation of Acura's top-of-the-line SUV to be designed, developed and engineered in North America. Production of the new MDX and its powertrain will take place at the company's state-of-the-art manufacturing facility in Lincoln, Alabama. In designing the new MDX, Acura engineers built on the foundation of its excellent dynamic performance with a focus on three core values: class-leading fuel efficiency, new levels of luxury comfort, and top-level safety performance. The well-equipped MDX has standard leather trimmed first- and second-row seats with heating on the front row, Smart Entry with Push Button Start (front doors and rear hatch access), a 432-watt audio system with 8-speakers, 18-inch alloy wheels, Jewel Eye™ LED headlights, and more. The MDX with Technology Package adds 19-inch alloy wheels, Smart Entry for all four doors, the Acura Navigation System with Voice Recognition™, a 501-watt Acura/ELS® Studio audio system with 10-speakers, Forward Collision Warning (FCW), Lane Departure Warning (LDW) and Blind Spot Information (BSI) System and more. The MDX with Technology and Rear Entertainment Package adds a 529-watt Acura/ELS® Studio audio system with 11-speakers and HD Radio™, a DVD rear entertainment system with 9-inch display, rear-passenger window sunshades, and other features. The top-of-the-line MDX with Advance Package includes unique 7-spoke 19-inch alloy wheels, a 605-watt Acura/ELS® Studio audio system with 12-speakers, the Acura DVD Ultra-Wide Rear Entertainment System with 16.2-inch display, perforated Milano leather first- and second-row seating and ventilated front seats, front and rear parking sensors and remote engine start, along with Lane Keeping Assist System (LKAS), Collision Mitigation Brake System, Adaptive Cruise Control (ACC) with Low-Speed Follow, and additional luxury features. 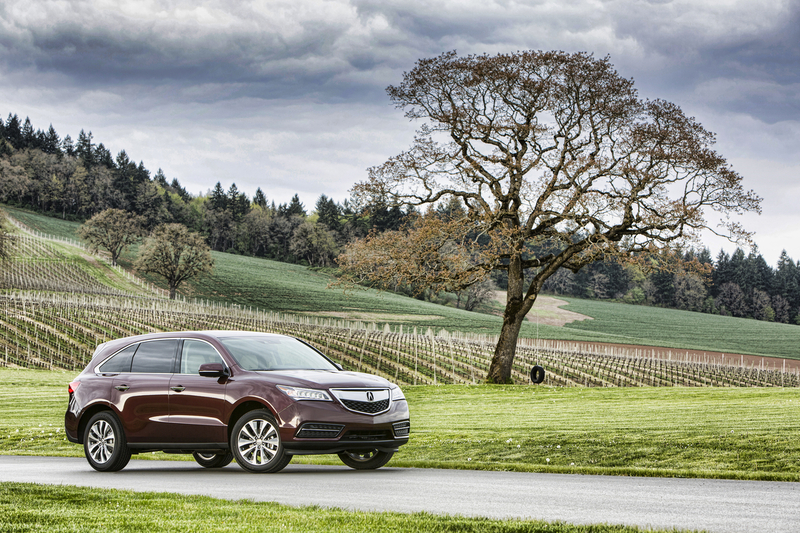 For more on the 2014 Acura MDX, click here for the press release.